Add some fluidity in your everyday operations thanks to Odoo! You have just started your business? Why spend a fortune on a complex ERP solution, way too big for your needs? At Arche TI we understand that young companies need an ERP just as big companies but perfectly adapted to their reality. Unlike conventional ERPs (that only provide super expensive and complex systems), we are able to integrate Odoo apps one at a time according to your real needs. At Arche TI we really listen to you and we find creative solutions to perfectly suit your priorities. 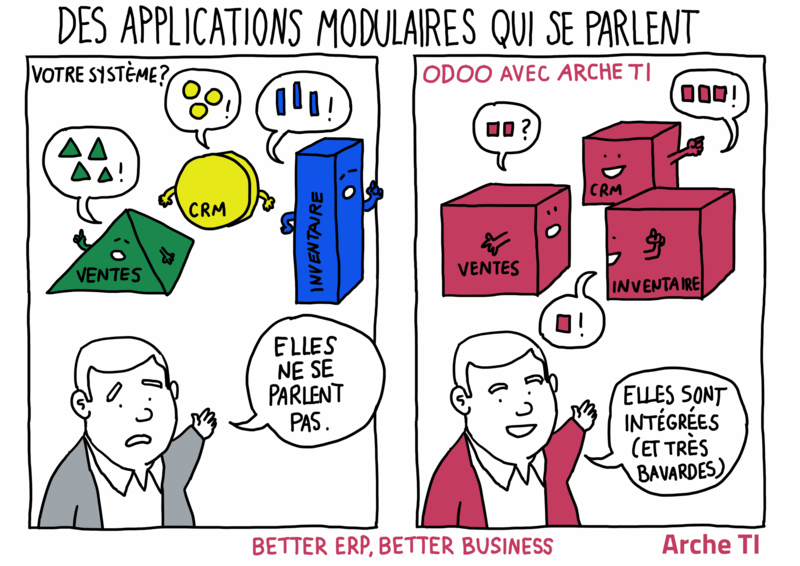 No matter the size of your business, we all have the same stake: a global understanding and a transverse vision of our activities to optimize them.With Odoo and the help of Arche TI, it’s within reach in a few months only. With the various apps that actually talk to each other, all the data can be cross analyzed and aggregated. This gives you access to a vast quantity of unsuspected information ready to be capitalized! Now that’s what we call a complete vision of your business!